I know it might seem as though I’m not making anything … but the opposite is truth … I’m finishing my second commissioned quilt, which I don’t feel comfortable publishing, as it’s not my work – except for the quilting. But we have been busy in our house and atelier. The baby is due in about two month (which reminds me I should start slowly prepare my hospital bag) and so we started to get the house sorted and ready. I don’t know why we started with the atelier, where the baby won’t have any access for quite a few years! But it all happened while my mum was still here - we took everything out of the atelier – all the stuff, we only left empty furniture. Well … as you can see we left shelf full of books and my mum working on her piece there was not much she could do anyway because it was all our “crap”. 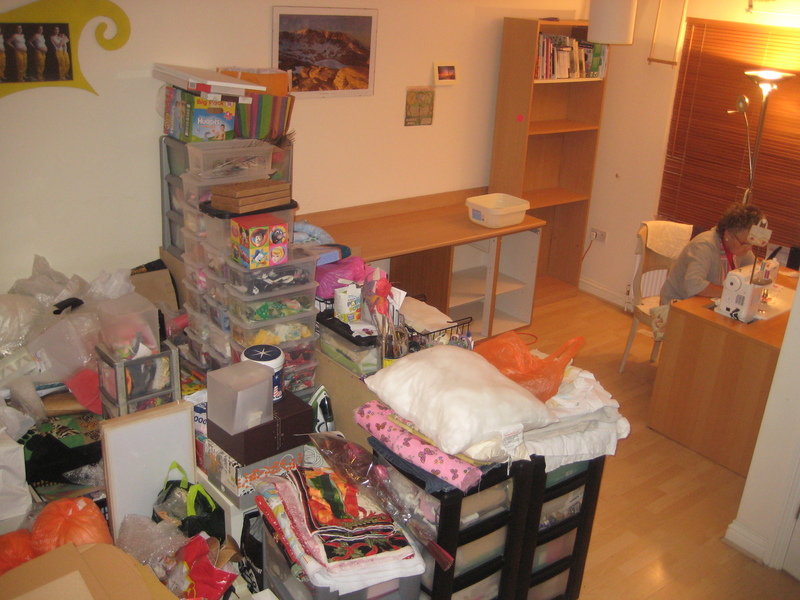 All the stuff on the left side came from inside the shelves and drawers – increadible, huh?? All the shelves were wiped, and at the end Mum had to stop sewing so that my beloved table where Oli built my machine into has been moved and dusted all around! Of course back came only what we really are going to use one day! And we’re planning to make a lot of things! But there were things which did ended up in the bin! But all the things we wanted to keep found their nice place, box or shelf. 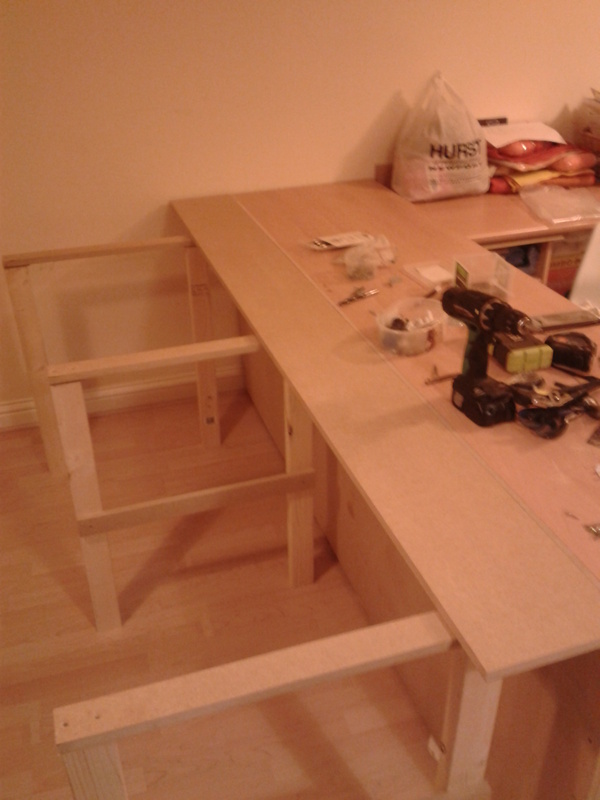 And of course the worktop and ironing board are covered with stuff at the moment – but once I finish with my projects, all can come back at it’s place! 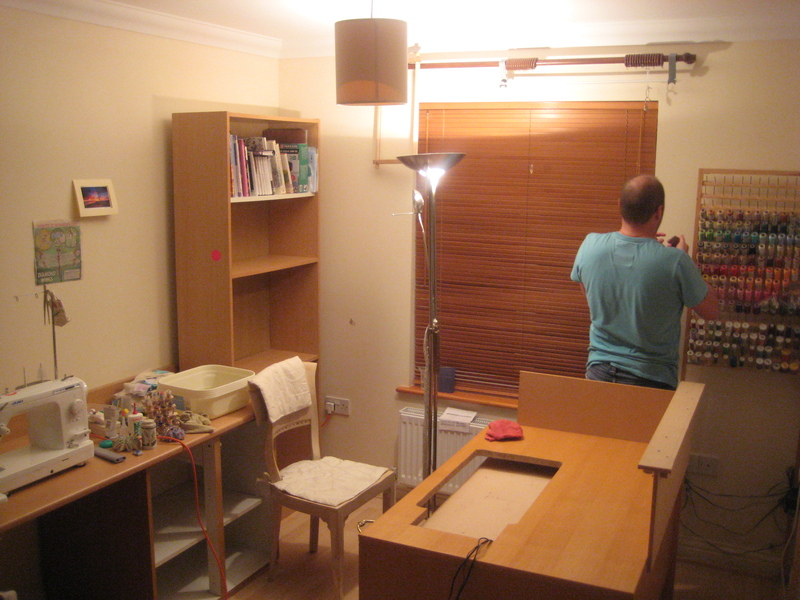 And this proper tidying was so good, we decided to continue in the rest of the house as well. All the upstairs carpets were cleaned since, which meant take again everything out of each room (which we did one by one) and we followed the same strategy – bring back only what you really need!! This time much more stuff has left the house. But during about three weeks all upstairs – 3 bedrooms and 2 bathrooms are cleaned, sorted with no junk and plenty of space to bring Moses basket, changing table, little bath and who knows what else is hiding in the top floor above our shop! And as I’m taking it a bit easier and things take a bit longer than usually, it did took a while, but it was all worth it! The house feels so much lighter and fresher! Luckily Oli does the kitchen regularly – as he’s cooking the cakes in so all left now is cupboard full of paperwork …. well I see that happening in December, when I’m not teaching but Jasmine is still at nursery!! I can’t have her around “helping” me with papers! 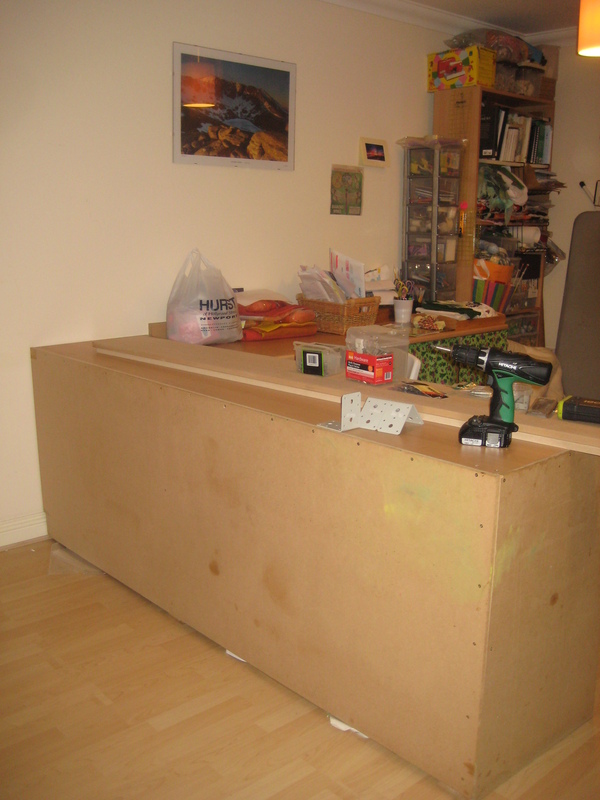 But there is one more thing which happened since … as we reorganized everything in the atelier, there was actually no junk sitting on the worktops! And so Oli decided to built an extension wing he was talking about for quite a while … as we really have just available evenings, everything is taking just those few days more. But look at the beauty he has built! 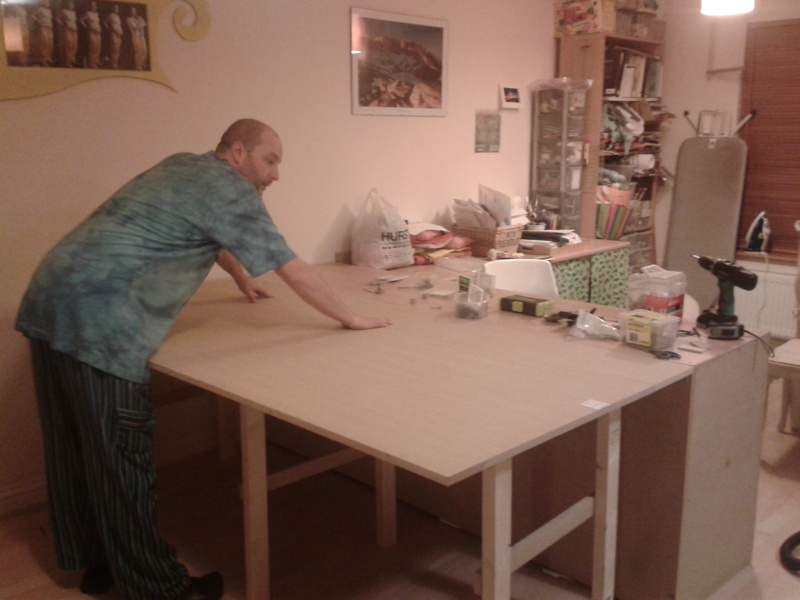 Before the extension the table was 55cm/ 22″ wide which was OK …. Legs which can be moved and the whole table folded down. Oli is very pleased with his extension! the width now is 153 ” / 60″ which is 5′ and add the length 215cm / 85″ which makes 7′. Now it’s all panted and waterproofed and Oli started to felt larger pieces … which was for a long time his dream … there are few things coming out, but let me talk about them some other time …. 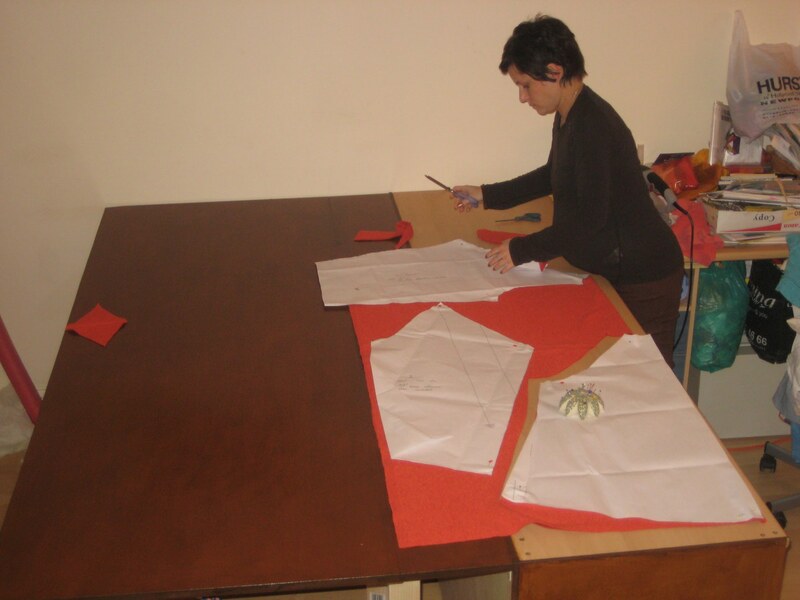 I have already used it to trace a pattern and cut a fabrics from the pattern for a jacket for Olivier’s mum … which is coming out really lovely … I promise I write about it soon!! 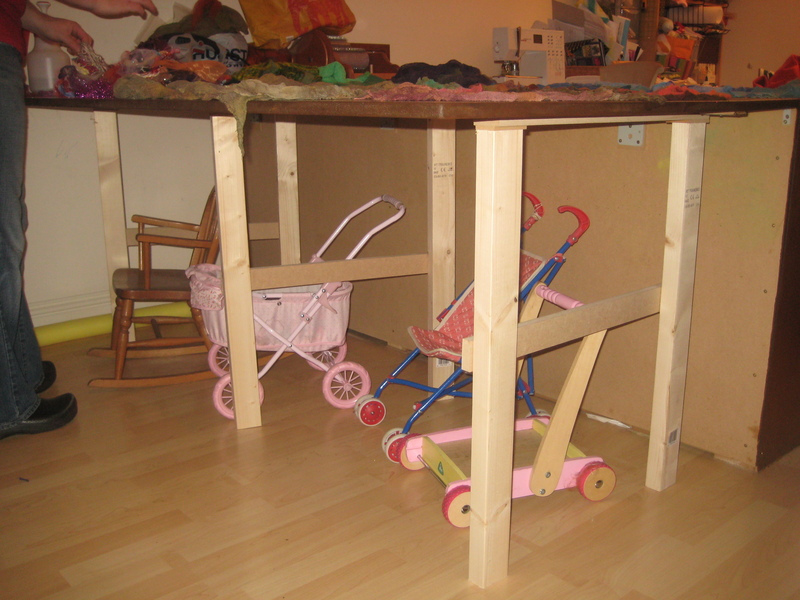 Last picture … ever since he has build this the table hasn’t been folded down, so Jasmine has found another use for the table … perfect parking place!! !